Stan Ray’s Ringshield™ and Ringuard™ system is designed to give lobstermen the ability to fish their traps more efficiently with either Ringshield™ by itself, or with the Ringuard™ attachment. Together they form a guarded "One-way" entry system for the kitchen head ring openings. 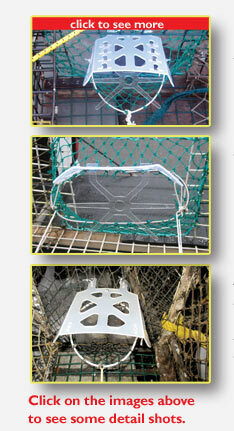 Our unique design allows Lobstermen to adjust or trim-cut the shield and/or guard to their own personal specifications. Quick and easy fastening with either hog rings, cable ties, or twine. They can be installed onboard or on land at any time. The working side hinges allow the shield system to be used on most head rings from 5”- 9" in diameter, making a "one-size fits all." The non-bouyant, invisible, plastic Ringuard™ allows the lobster to pass through the head rings with little or no resistance. Once the lobster has entered the trap the Ringuard™ sinks back to position, resting against the ring, enhancing trap efficiency!